I’ve just released a new update to Class 3 Outbreak, which lets the map author set the map’s start position (where the initial group of survivors starts at the beginning of the game). Previously this was always just the centre of the map. To set your map’s start position, load the map in the editor and then click the Start Position button at the top. You can then move the map to the desired location. While you move the map, the editor shows the position of the three starting survivors. Usually this is in a standard pattern, but they will be moved to the nearest allowed location if there’s something in the way like a wall. 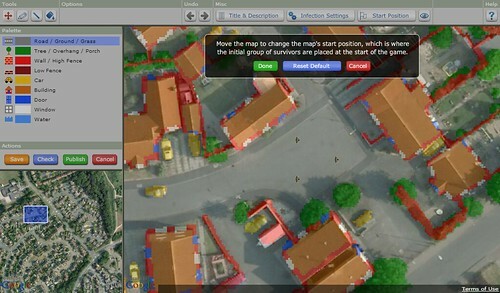 Once you’ve chosen the position you want, click Done, then save and re-publish your map. Then you’re ready to play! A minor change in this update is that you can now also pan the map outside of the map’s playing area. This is so that you can see your starting survivors if the map’s start position is set to near the edge of the map. This also solves the problem of being able to see or control people under the minimap / weapons / build / search UI at the bottom of the screen. In a case of inconvenient timing, the servers which C3O run on are doing some maintenance tomorrow. This will start at 1:00 am on Friday the 4th of January UTC (5:00 pm Thursday the 3rd of January PST, see here for your timezone), and run for about 2 hours. During this time the website will be in read-only mode. So you’ll be able to play existing maps, but the editor will be disabled – and so you’ll be unable to set the start position of your map :( If you see a message about the editor being unavailable, just try again a bit later. The next feature I’ll be working on for C3O will be adding objectives which the map author can choose – such as kill all the zombies, or survive for X minutes, or get to location Y, etc. And on the mobile side, I’ll be trying a few more ideas to get Google Maps back on Zombie Outbreak Simulator for iOS.